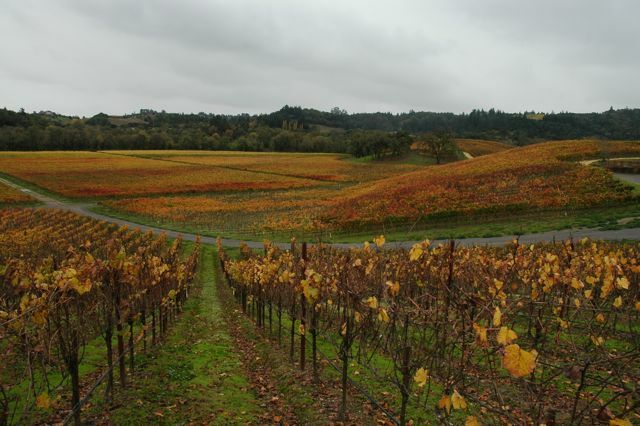 Back in November we had the pleasure of meeting the writer David Mahoney who was in Sonoma county to interview winemakers with ties to Minnesota. During his visit, David interviewed Dave Ready from Murphy-Goode, Scott Adams from Bella Winery, Dan Gustafson of Gustafson Family Vineyards, and our winemaker Alan Baker. We had a great time tasting David on our 2009 Floodgate Vineyard Pinot Noir which had recently been bottled, the 2009 Floodgate Vineyard Gewurztraminer, and the 2006 Wentzel Vineyard Pinot Noir which was the first commercial wine Alan made. We chatted about the 2009 and 2010 harvests, Alan’s winemaking philosophy, and the story behind Alan’s move in 2005 from Minnesota to Healdsburg to pursue winemaking. As the fog lifted we went out to Floodgate Vineyard. It’s always fun to taste the wine and then actually see the vines from which the grapes come. It was one of those beautiful wine country days where the colors of the leaves in the vineyard were vivid, and the fog was rolling back to reveal a brilliant blue sky with a hint of someone’s wood fire in the air. David’s article, titled “Living in Zin” came out in January’s issue of Artful Living. We are looking forward to being in the Twin Cities the last week of January and meeting the Artful Living team. Previous post: 2010, What a Year in the Vineyard! Next post: Gewürztraminer: 2009 was a success, what’s happening with 2010?